Fifteen United Methodist clergy and clergy candidates took a leap of faith together and came out as lesbian, gay, bisexual and queer members of the New York Conference. “It is with fear and trembling that I step forward and step out,” said the Rev. Siobhan Sargent, associate pastor at the United Methodist Church of St. Paul and St. Andrew in New York and one of the 15 signers of an open letter to the people of The United Methodist Church. The Rev. 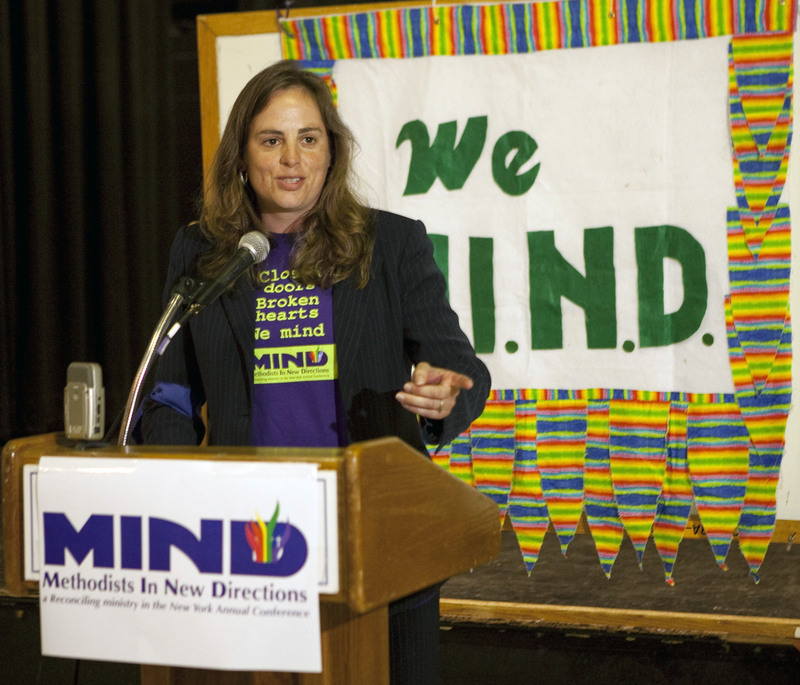 Sara Thompson Tweedy speaks at a Methodist In New Directions event during the New York Annual Conference at Hofstra University, Hempstead, N.Y., on June 7, 2013. File photo by Dave Sanders. This is the first time clergy and candidates have come out as gay in a group. It could be a chargeable offense under United Methodist Church law for a LBGTQ person to be ordained. The announcement comes just days before the 2016 General Conference opens in Portland, Oregon, on May 10. “Charges could be brought against me, but I will no longer lie about who I am in order to be in ministry. I pray for the day when we can all live as our authentic selves in the church,” Lamb said. Lea Matthews, director of ministry operations at St. Paul and St. Andrew, will be commissioned as a deacon in June. In July, she will take on the role of associate pastor of family life and connection. She also signed the open letter. “While I understand that I risk my standing in The United Methodist Church with this public step, I do so following the way of Jesus. I do not walk this path alone. I am surrounded by a cloud of witnesses, made up of my fellow signers, our brave allies in this conference, and my church family at SPSA, who offer prayerful support. I sign in solidarity with those on the letter, and acknowledge that there are many others across the denomination who are not as fortunate as we are here in the New York Annual Conference,” she said. The New York Conference has spoken out against the denomination’s exclusion of LGBTQ people from ordained ministry for decades. On March 1 the conference’s board of ordained ministry announced it would not consider sexual orientation in evaluating a clergy candidate even if that individual has a spouse of the same gender. Middleton asked for patience, understanding and love from those who made the statement and from those who believe the pastors are wrong. The bishop said she would send a pastoral letter to some members of the conference later on May 2. “The church is asking us not to be fully human. There comes a time when oppressed people have to stand up for themselves and their lives and this is our time,” said the Rev. Sara Thompson Tweedy, chair of Methodists in New Directions, which organized the group effort to release the letter. Tweedy faced an official complaint in 2013 for being a “self-avowed practicing” gay clergy member. The complaint was dismissed after 14 months of investigation. “There are 15 of us who are nervous, scared, excited and holding together because we believe we have to tell our truth, and I hope the church listens,” Tweedy said. 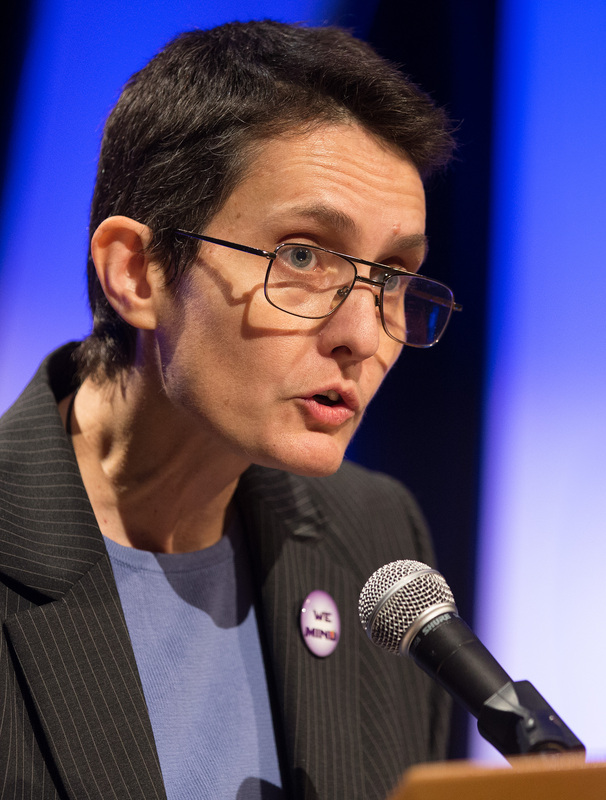 Dorothee Benz takes part in a panel discussion during the 2016 Pre-General Conference Briefing in Portland, Ore.
Dorothee Benz, a delegate to the 2016 United Methodist General Conference and founding member of MIND, said for more than 40 years, LBGTQ people have been pleading for a change. Benz said the institutional channels to change are closed to LBGTQ people. “We have no other ways to plead with the church to make a change other than direct action,” she said. “This is big step forward, it is hugely inspiring to me as a lay person whose job is not on the line to have my clergy colleagues to do this and to do this as a group is powerful,” Benz said. “I have never ever had a bishop ask me how it feels to be an out LGBTQ clergyperson — not one,” Tweedy said. “We cannot pretend to somehow excise the queer parts of ourselves; we can no longer be forced to separate our sexuality and spirituality – a part of ourselves that is interconnected – in order to stay in ministry,” he said. The letter named clergy and clergy candidates who have faced complaints or been removed from United Methodist ministry: Cynthia Meyer, Benjamin Hutchison, M Barclay, Amy DeLong, Drew Phoenix, Beth Stroud, Karen Dammann, Rebecca Steen, Mark Williams and Rose Mary Denman.